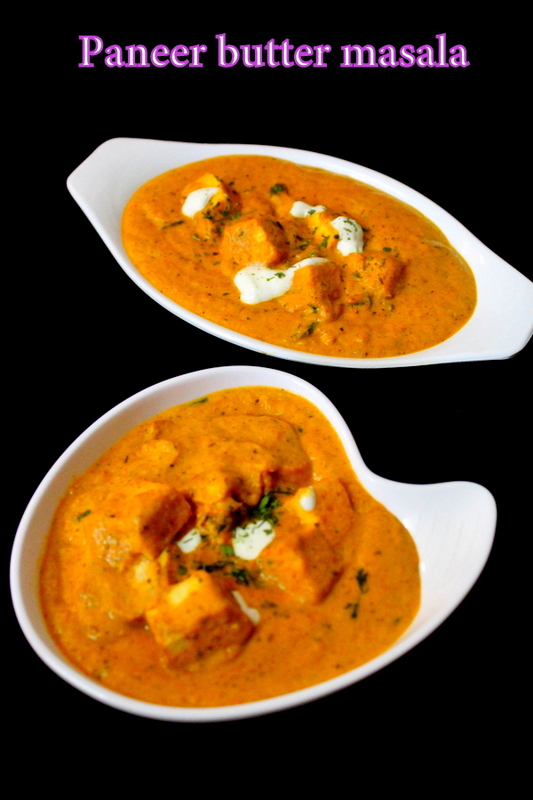 Paneer butter masala is shared with step by step details and video procedure. It is a hugely popular north indian and punjabi delicacy commonly made during weddings and several occasions. It is the most popular ordered dish in restaurants. Paneer is a very healthy substitute for non veg and this is mostly eaten by all the vegetarians. It is power packed with full of proteins and is used in several ways in many recipes. There are many recipes that are made with paneer. 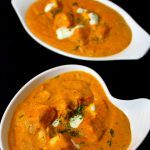 I have already shared matar paneer recipe in shahi style and chilli paneer and now would like to share another paneer recipe that is paneer butter masala. It’s a very yummy punjabi paneer curry which is served along with naan, tandoori roti or roomali roti. It is made in the form of a rich gravy made by using onions, tomatoes, cashewnuts and cream/malai. These ingredients are cooked first in some aromatic spices and then they are pureed. The puree is then cooked with some more spices and paneer is added into it. 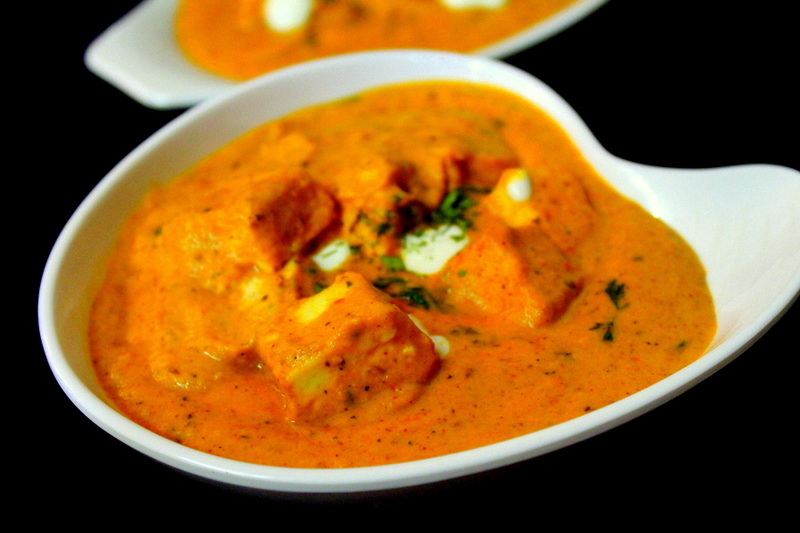 The recipe is called as paneer butter masala as it has got some butter added into it along with regular refined oil. Butter that is added into the masala along with cream and cashews makes the gravy a rich and delicious one. This recipe can be made quickly and a very aromatic flavor comes out of the masala as we add crushed kasoori methi into it and the whole flavors come out perfectly just because of this ingredient. I would like to add some more paneer recipes to my blog and I always believe in showing genuine recipes to my food blog readers and therefore, next time I come up with another paneer recipe, it surely would be an authentic paneer delicacy made like restaurant ones. Paneer can be easily made at home and is also easily available in markets. Make sure paneer is always used fresh in curries. It should be handled carefully when added in curries otherwise there are chances that it might break. 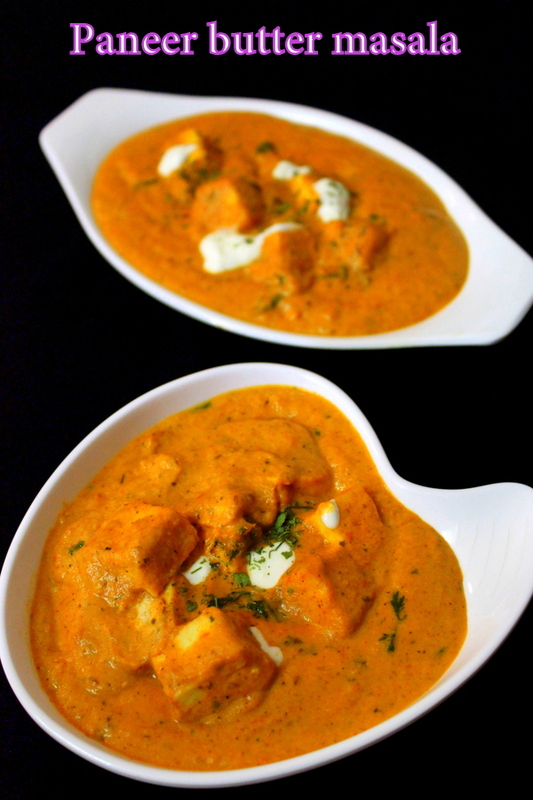 A very rich and creamy gravy made using onions, tomatoes, cashewnuts, cream and paneer. Firstly, take a pan, into it add some butter, oil and heat it. Add chopped onions, chopped tomatoes, cashewnuts, green chillies, salt as per taste, kashmiri red chilli powder, turmeric powder and mix well. Cook the whole mixture for few minutes. When the mixture gets cooked, switch off the flame and allow it to cool. Take a blender, into it, add the mixture that has been cooled down. Blend the mixture into a smooth paste. Add half a cup of water and blend the mixture again into a smooth fine puree and transfer it into a bowl. Take a wok, into it add butter, oil and heat it. Add kashmiri red chilli powder and saute it for few seconds on low flame. Add the blended onion tomato cashew puree. Add salt, sugar, coriander seeds powder, garam masala powder, mix well. Cook this mixture for few minutes on low flame until oil appears at the sides. Add cubes of paneer, mix it delicately, add chopped coriander leaves, add crushed kasoori methi. Mix and cook the masala for a minute on low flame. Add cream/malai and give a slight mix. Cook the whole paneer butter masala for about 2-3 minutes on low flame. Paneer butter masala is ready to be served. Serve it with tandoori roti or naan and enjoy!!!. 1.Always use fresh paneer to make any paneer recipe. 2.Do not overcook paneer as it gets firm and chewy due to overcooking. 3.Here, in this recipe I have not strained the puree but if you wish to have more smooth and shiny gravy then, we can strain the blended puree.